Gypsy Rose Crystal Body Deodorant leaves a thin film of mineral salts on the skin which effectively destroys and prevents odour-causing bacteria. Made from 100% natural mineral salts, this long lasting astringent, remains on the skin for long lasting protection from body odour and sweat. Unlike modern anti-antiperspirants and deodorants, Gypsy Rose’s Crystal Body deodorant contains no harmful aluminium or other substances which can be absorbed through the skin. Instead it is a pure crystalline substance composed of pure potassium alum salts, the particles of which according to studies conducted in Europe have proven to be unable to absorb through the skin or into the bloodstream. Long Lasting – a 100g roll-on, will last up to 1 year. Gypsy Rose Crystal Body Deodorant rolls on leaving a thin film of mineral salts on the skin which effectively destroys and also prevents odour-causing bacteria. The crystal is made up of 100% natural mineral salts. 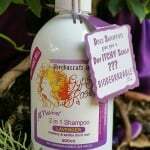 Furthermore this long lasting astringent, remains on the skin for long lasting protection from body odour and sweat. Most noteworthy, is its designed to dry up moisture as opposed to stopping perspiration. Thanks is due to mother nature, for this extraordinary natural creation. Most of all, its a healthier option for our skin & pores. While finally, there is no comparison to this in regards to modern anti-perspirants and deodorants. 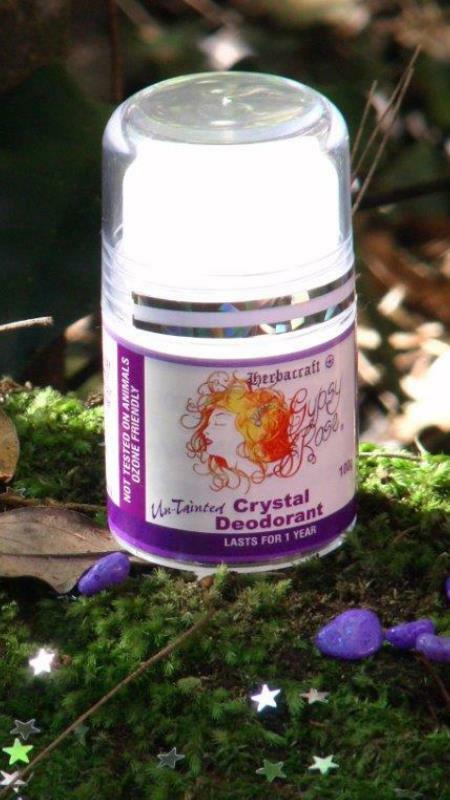 Gypsy Rose’s Crystal Body deodorant roll-oncontains no harmful aluminium. Also, it does not contain any other harmful ingredients or added substances. 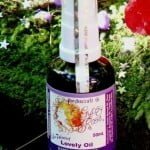 Most of all and especially revelant, no substance can be absorbed through the skin. Instead, due to its a pure crystalline substance composed of pure potassium alum salts, it remains on the skin. The particles, of which according to studies conducted in Europe, have proven to be unable to absorb through the skin or into the bloodstream. 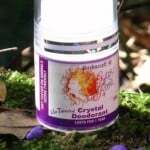 QUESTION: Is Gypsy Rose Crystal Body Deodorant safe for use by women during pregnancy? 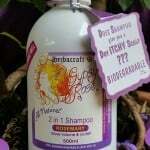 Yes, Gypsy Rose Crystal Body Deodorant are safe to use during pregnancy. 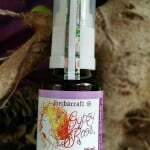 QUESTION: How should I use Gypsy Rose Crystal Body Deodorant for best results? ANSWER: Please see instructions for use tab. QUESTION: Will Gypsy Rose Crystal Body Deodorant reduce my sweat? ANSWER: No. 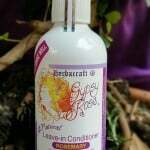 Gypsy Rose Crystal Body Deodorant is a deodorant not an antiperspirant. It is a deodorant whose natural mineral salts prevent odor. 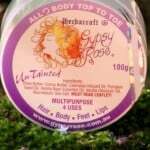 QUESTION: Can I use Gypsy Rose Crystal Body Deodorant on other parts of my body? 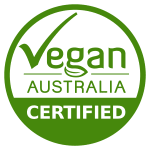 ANSWER: Since Gypsy Rose Crystal Body Deodorant contains only pure natural mineral salts, they are safe to use on the entire body – especially the feet, inner thighs and underarms. QUESTION: How long will a single application prevent body odor? ANSWER: A single application of a Crystal natural deodorant should prevent body odor for up to 24 hours, however, for best results (especially in Summer) we suggest twice daily for maximum peace of mind. 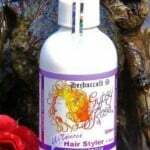 Gypsy Rose Crystal Body Deodorant is applied using a simple and convenient roll-on applicator. Apply Gypsy Rose Crystal Body Deodorant immediately after showering or bathing, as the product creates a preventative barrier, doing so stops the bacteria that cause odor from forming on the skin. Apply always a wet crystal liberally to feet & or underarms. You must assure crystal is wet as you apply. It is recommended that during summer, Gypsy Rose Crystal Body Deodorant be applied twice daily for effective moisture absorption. Not to be taken by mouth/ discontinue if causes discomfort. Crystal Rock Alum, a pure crystalline substance composed of pure natural minerals (potassium alum salts). Our Crystal Rock is sourced from Thailand, as it is the premier source of the highest quality crystal rock alum in the world.